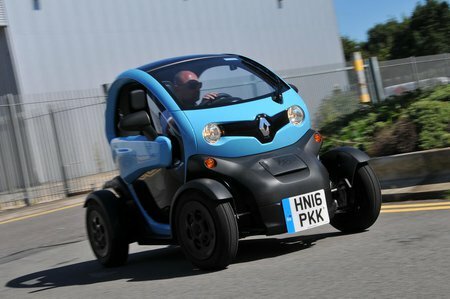 Renault Twizy Performance, Engine, Ride, Handling | What Car? The Twizy is a doddle to drive. There’s a conventional steering wheel, two pedals (an accelerator and a brake) and just three buttons on the dashboard. Hit the one labelled D, release the handbrake and you’re off. While the Twizy moves away in near silence, you’ll soon hear the distinctive whine of the electric motor as you gain speed. This begins to grate after a while, and because there are no doors or windows as standard, you’re exposed to the elements and the general hubbub of other traffic. Expect to have to shout to communicate with your passenger behind you. The steering is direct and surprisingly well weighted, the brakes are progressive and the turning circle is an astonishing 6.8 metres; that’s smaller than a Smart Fortwo, itself a king of urban manoeuvrability. Outright stopping power isn’t very impressive though, mainly due to the Twizy’s narrow tyres, and there are no anti-lock brakes to prevent you locking up. That's a serious safety shortcoming. The Twizy weighs less than half as much as a Ford Fiesta, so performance isn’t as shabby as you might imagine. Sure, top speed is only 50mph and it takes a while to get there, but acceleration away from the lights is reasonable and Renault quotes a 0-28mph time of 6.1 seconds. Put simply, performance is adequate for nipping around towns and cities, and even short A-road stints aren’t out of the question. We wouldn’t advise venturing onto the motorway, even though some Twizy owners do. Altogether less impressive is the ride; it’s far too firm at any speed, and particularly painful over urban potholes and speed bumps. For reference, the Twizy is less comfortable than any normal road car you’ll ever have driven.